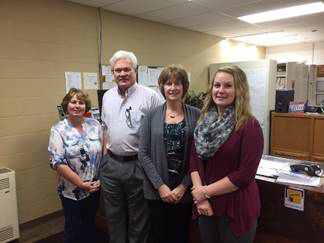 This month “In Focus” looks at Forestburg Agencies Ltd., an insurance Brokerage located right here on the main Street of Forestburg (4909- 50 St). It has been in operation since 1921 when it was operated by the Farvolden family. In 1980 Rick and Gail Foster bought the shares of the Company, which they ran until 1991, when the Lemay family purchased it. Greg Lemay continues to operate to this day, providing a full range of competitive General Insurance products representing a host of top of the line Canadian Companies to the Community and surrounding area. The Brokerage also offers a full line of General Insurance offerings and also operates an Alberta Registries outlet to serve the community. Greg is an avid hunter, which is one of the first things you will notice uponentering his office. He is also very active in the community supporting local sports groups, from behind the scene, such as the soccer team. Greg has spent many years on the Council in Forestburg, from 2010 -2007 and as Mayor. He was also involved in Provincial Politics.